“Books break the shackles of time – proof that humans can work magic.” – Carl Sagan. I have been writing about the benefits of finding moments of stillness and quiet in our busy lives over on my Leaping Tracks blog recently. Becoming absorbed in a good book is one of my favourite ways to find a place of calm, even if there is plenty going on around me. I have read some cracking books recently, largely as a result of recommendations by fellow book lovers. So I wanted to share a few thoughts on these titles in case they prove to be of interest to others too. The Heart Goes Last by Margaret Atwood – this book was highlighted via Madame Bibliophile Recommends who has been participating in the currently running ‘Margaret Atwood Reading Month’. I liked Madame B’s description of this story and was able to download an e-library version (hoorah for libraries!). So rather unexpectedly, I can count myself as having participated in MARM too. Being Atwood, this story is of course set in a dystopian near-future. But I found it to be much more light-hearted and comic than her other work. In fact it reminded me a lot of Carl Hiaasen‘s rather whacky and chaotic crime stories. In his books, as is the case with The Heart Goes Last, the characters get themselves into highly improbable situations, yet we can see clearly how their journeys have a sense of inevitability about them. Atwood explores very deftly the age old conundrum about whether the grass really is greener on the other side of the fence. And the reader is constantly challenged to consider what they would do in a similar situation. If you have every asked yourself ‘how on earth did I get myself into X position’, which must be most of us, this story is for you. Carol by Patricia Highsmith – this was recommended by Kate over at Booksaremyfavouriteandbest and I completely agree with her that this is a beautiful narrative which explores different kinds of love very sympathetically, without ever becoming schmalzy or judgemental. I constantly stopped to re-read passages which I found heart-stopping and poetic. Overall, this is a quiet novel which hums along with its compelling story. I plan to watch the film, and will definitely be reading more Highsmith. Mary & O’Neil by Justin Cronin was also a Kate recommendation (thanks Kate!). This is another quiet book which gently and tenderly explores parental, sibling and partner relationships. Cronin has a wonderful writing style and is able to hold the reader’s attention with a simple yet gorgeously rendered story. I will be looking out for more of his work. The Spinning Heart by Donal Ryan was mentioned by Ann in one of her reading round-ups. It caught my eye because I have already ordered Ryan’s latest novel, From a Low and Quiet Place. It is very creatively structured into a series of short story-esque chapters, all from a different character’s point of view. Each narrative links with and illuminate the others and in this way it reminded me of the wonderful Olive Kitteridge by Elizabeth Strout (who, by the way, will be bringing out her second Olive book next year – can’t wait!). Ryan’s portrayal of the individuals in a beleaguered Irish community is absolutely captivating and I am looking forward to reading his other work. The King’s Witch by Tracy Borman – I very much enjoyed Borman’s contribution to this podcast with fellow author Manda Scott (whose latest book, A Treachery of Spies is currently on my nightstand). The starting point for The King’s Witch is the relentless persecution by the newly crowned James I of anyone (usually women) who demonstrated any kind of ‘suspicious’ skills, such as helping and healing others with natural remedies. Borman creates a page-turning narrative packed with historical interest, which is not surprising because she is well known as a historian focusing mainly on the Tudor and surrounding periods. Miss Garnet’s Angel by Salley Vickers – last but not least, I have re-read this book after picking it for one of my six degrees of separation posts. It is even better than I remembered. I have savoured every word of this gentle and moving tale which explores our tendency to develop preconceived ideas about things, and the wonder which comes when we allow ourselves to be ‘wrong’ and instead set ourselves free to think whatever we like about anything or anyone. Welcome to the start of another week. What kind of plans do you have in store? Are you able to embrace the thought of dealing with whatever comes your way? Raring to go, full of joy for being alive and in the moment? Or are you anxious about the days ahead? Stressed? Fearful? The spiritual teacher Byron Katie says “You can argue with the way things are. You’ll lose but only 100% of the time”. It can be hard to accept what is in front of us with equanimity and a peaceful mind. It is a simple concept, but not an easy one. Yet we can get there in a split second. We control our thoughts, not the other way round. We can decide what to think about any event or situation. We can choose acceptance over resistance. To use a relatively trivial-sounding example, I have a residual fear of engaging with e-mails, as a result of a devastating experience at work a few years ago. These days, I lead a blessed and happy life. But when it comes to thinking about my in-box, I am consumed with anxiety about what might lurk there. So I put off opening my mailbox for as long as possible. Eventually, given the way the world works these days, I have to draw on those famous words by Susan Jeffers and ‘feel the fear and do it anyway’. Having taken a deep breath and opened my messages, what do I find? A long list, not of horrors after all, but of stress-free items which I can handle perfectly well. Once I can see the true content of my in-box, only then do I recognise that it is the muscle-memory of past times which has been controlling my thoughts and therefore my emotions, not the logic behind what is most likely to exist when I switch on the computer. I am using the practice of acceptance to help me overcome this fear. 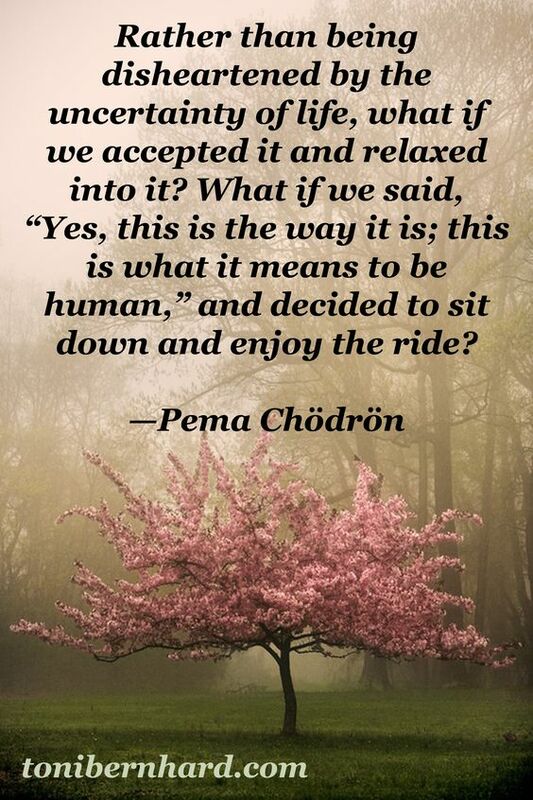 By taking a moment to recognise my present reality, and by relaxing into it, as Pema Chödrön puts it, I can engage with this aspect of my life with a calm, still presence, regardless of what shows up. I hope this approach might also be useful for you, if and when you find yourself dealing with difficult or unexpected events. There is no path to peace. Peace is the path.